Twenty-five years ago, the Australian Catholic Bishops Conference published Common Wealth for the Common Good: A Statement on the Distribution of Wealth in Australia. Published in the early days of neoliberalism, that document was primarily focused on the distribution of wealth. Part of the critique of that document, as of much church teaching of the time, was that the church did not take seriously enough what was required for the creation of wealth, or what was to be done in the use of wealth once it was distributed. 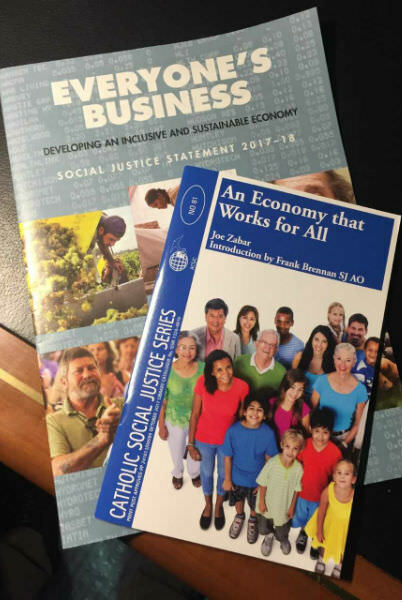 A quarter of a century later, the Catholic bishops' 2017 Social Justice Statement Everyone's Business: Developing an inclusive and sustainable economy focuses not just on the distribution of wealth, but also on its creation and its use. Creation, distribution and use of wealth are assessed against the principles of Catholic social teaching. These principles have universal application even in a neoliberal environment that gives precedence to markets and competition as the preferred means of creating economic growth and utilising the fruits of that growth for individual wellbeing and the common good. The Australian bishops agree with Pope Francis that the 'trickle-down theories which assume that economic growth, encouraged by a free market, will inevitably succeed in bringing about greater justice and inclusiveness in the world' have not been proved. Every year since the publication of Common Wealth for the Common Good, the Australian economy has grown. Our GDP has more than doubled; so too have average wages. But our bishops are convinced that inequality has increased. Even 26 years of successive economic growth has been insufficient to assure the poorest Australians a dignified though frugal existence. For example, Australians reliant on Newstart or the Youth Allowance simply do not have enough to live on. It's now five years since the Business Council of Australia told the Parliament: 'The rate of the Newstart Allowance for jobseekers no longer meets a reasonable community standard of adequacy and may now be so low as to represent a barrier to employment.' And still there has been no increase to Newstart, and a government looking for a narrative has decided to demonise the recipients. As the bishops point out in Everyone's Business, Newstart recipients are $110 per week below the poverty line, and youth allowance recipients are $159 below the poverty line. In an age of 'budget repair', steady five-plus per cent unemployment, high underemployment, and sluggish or non-existent wage growth for most workers, it is difficult for any unemployed person to find a job. There are ten applicants for every job on offer. No matter how job ready you make the unemployed, their prospects of finding work are not going to be greatly enhanced in the present economic climate. Meanwhile, housing is becoming less affordable, particularly for young people in the big cities. The future prospects of young Australians are becoming more dependent on the wealth, property and disposable income of their parents. Australia's leaders must decide whether to continue down a path of growing inequality and exclusion or to harness the good of free enterprise to better serve the society as a whole. This morning I am delighted to launch the latest paper from Catholic Social Services Australia (CSSA) entitled An Economy That Works for All. And I pay tribute to Joe Zabar, CSSA's senior director, strategic operations and economic policy, the principal author of the paper. It's great that Joe's wife Poppy and daughter Madeline are here with us proudly saluting Joe's industry and passion for social justice. At Catholic Social Services we know that too many people have been left behind, denied access to economic prosperity and the opportunity and the hope it brings. The Catholic Church has a role to play in encouraging action from those in power to deliver an economy that serves all in our community, particularly the most vulnerable, because it is one of the organisations who help the poor and vulnerable people who have been left behind. Rather than continually trying to help these people to play catch up, we want to help bring about change to ensure they are not left behind in the first place. Individuals don't choose poverty. Poverty is a choice we make as a society. "We Australians need to focus more on how our unprecedented wealth gives us a one off and unprecedented opportunity to break the cycle of poverty, through education and lifelong support, which we must take." We need our leaders to acknowledge that our economic system has lost its way, giving preference to the purity of the market without due regard to the society in which it operates. Under the neoliberal paradigm, markets are supposed to create economic prosperity and growth, which will then 'trickle down' to all those participating in the economy. After more than four decades of this paradigm, there can be no doubt that 'trickle-down' economics has been of great benefit to those at the top of the pyramid. However, the promise of riches from the trickle-down effect is at best patchy for many Australians, and non-existent for others. Establish an independent commission to develop evidence-based benchmarks to ensure that income support payments are adequate for people to live a frugal yet dignified life, and have realistic opportunity of securing a job. Our politicians don't set wages on Budget night. Neither should they set welfare payments. Strengthen our tax and transfer system. For Australia's tax and transfer system to work effectively, we must, prioritise the needs of society first and then work out the best way to fund those needs. We must put the needs of the poor and vulnerable first. Establish a new national accord between government, civil society and business. This accord would outline the responsibilities of each sector in building a fair, flourishing and just society. Deliver greater transparency, through the public release of government economic modelling of all budgetary measures that affect the economic wellbeing of Australians, especially the poorest and most vulnerable in our society. Create a new position on the RBA Board. Appoint a preeminent Australian who has knowledge and experience of the consequences of monetary policy on the poor and marginalised to reinforce the inter-connectedness of economic and social policy and acknowledge the role the RBA can play in using monetary policy to improve the lives of the poorest and most marginalised in our society. For too long, we have overlooked that the Reserve Bank board is charged by statute not only to look to the stability of the Australian currency and to the maintenance of full employment but also to the economic prosperity and welfare of all Australians. We Australians need to focus more on how our unprecedented wealth gives us a one off and unprecedented opportunity to break the cycle of poverty, through education and lifelong support, which we must take, not only in justice but also because we cannot afford to leave anyone behind who is able and willing to contribute. We need economic policies that are based on, and build on, the aspirations of the marginalised and excluded who yearn for the opportunity to access the market, sharing the fruits of Australia's prosperity. Taking up widening income inequality as what the IMF has identified as 'the defining challenge of our time', Zabar provides a blueprint for future reform when he outlines the contours of An Economy That Works for All. There can be no sustainable 'budget repair' without ensuring a robust safety net and an assured leg up for those missing out through no fault of their own. Unfortunately, the Catholic Church having spent millions of our money on defending paedophiles has left it with very little credibility. Yes, yes, yes, yes, yes... Great to see the Church moving from an innocent and naive view of business and the economy to making knowledgeable, balanced and practical proposals for change. Unfortunately, there seems to be a basic misunderstanding in this article, as to an extent there is in some of Pope francis`s statements: the neoliberal "trickle-down" theory is about allowing the rich to keep their wealth without taxation and NOT about how to "create" wealth the first place. After the various lived trials of the 20th century we know with certainty that properly balanced markets are the best and indeed only way to go, albeit with close monitoring that and regulation to ensure the markets are not being distorted by corruption, cronyism, or undue monopoly, and a number of other market failures, which do occur and need to be efficiently managed! Australia`s level of equality has never been better, so the claim to the contrary is another "un-truth" commonly claimed at the moment. This is because of steady economic growth and an aggressive redistributive tax regime. However, the one place the Fr Brennan is close to being correct is the poor levels of money given to the unemployed; there should be a level of "pension" which is the same across the board for those without a job or unable to work, equivalent to the aged pension at least. Indeed, I would strongly support a guaranteed decent wage for everyone regardless of a job or not, with the tax system then balancing it all out. Such a wage would be completely replace social welfare as we know it, which is quite a mess. But that does require a major tax reform effort to pay for it. The tax system is also bit of mess, so reform is well over-due. All of it of course must be in our tradition of progressiveness, but also including some form of progressive "wealth tax". With low interest rates it has been the wealthy who have gained most in non salary investment income and this is efforts!in urgent need of being sorted. That is where the Church and Fr Brennan should be putting their efforts, not attacking the creative capitalist golden goose. I’m with you Frank but before you can achieve anything you’ll need to persuade the many Catholics and other Christians in the Government to your point of view. While the 2017 Social Justice Statement has a very great deal to commend it, it is disappointing that a more direct consideration was not given to the environment and the physical limits to economic growth. One would hope that with a subtitle, "Developing an Inclusive and Sustainable Economy" the Steady State Economy, well defined by the economist Herman Daly over 20 years ago, would have featured in the Statement. Our transition from the growth economy to a steady state economy has to be planned in order to ensure that people are not excluded as a result of a collapse of our economic system. Rational people are capable of concluding the infinite economic growth is not possible on a planet of finite resources, even it it is called 'sustainable development'. Promoting an awareness of the need to transition to the Steady State Economy must be a concern of every socially aware Christian. Father Frank, I was fortunate to listen to your talk last night and completely agree with your comments then and your article here. I have to totally disagree with Eugene's view. The facts speak for themselves. The so called' trickle down effect' simply does not work. Neo liberalism has led to a widening disparity between the very wealthy and the lowest levels of our society over the last twenty or so years. The use of tax avoidance seems to have also increased despite the valiant efforts of the ATO. While the Church issues these social justice statements annually, they rarely get much mention in the media and that is where the problem lies. Thank heavens Pope Francis has championed the cause as his comments are getting a much needed media response. I have to agree with Phil Jones that the Church needs to be more forthright about the environmental costs of economic growth. Again Pope Francis has supported the need to combat Climate Change. As he says, the poor will suffer most. I disagree with you Eugene when you say that, "After the various lived trials of the 20th century we know with certainty that properly balanced markets are the best and indeed only way to go,." The Global Financial Crisis of 2007 - 2008 is one striking example of why this is incorrect. I also disagree strongly that, "Australia`s level of equality has never been better." In fact I think the opposite is true. I'm sure those who run organisations like The Vinnies, Salvation Army, Catholic Social Services and the like would be in the best position to evaluate this. Care is needed. Socialistic communism doesn't work either and indeed imposes more human distress than capitalism ever has. Capitalism, while sometimes obscene, does, however, provide the funds for welfare through employment and the taxes that come from it. Employment as a variable commodity, dictated by the need to produce gods and services, is not a human right. fr frank I totally agree with what you have said and I wish to add my own comments to this issue. I feel that this if we try to sit down and talk about the issue and try to come to some kind of agreement as to what should be done. we all know that the poor will suffer greatly because of ineffectual government policies and lets hope that somebody can come up with some sort of solution.